Your favorite summer dessert in ice cream form! 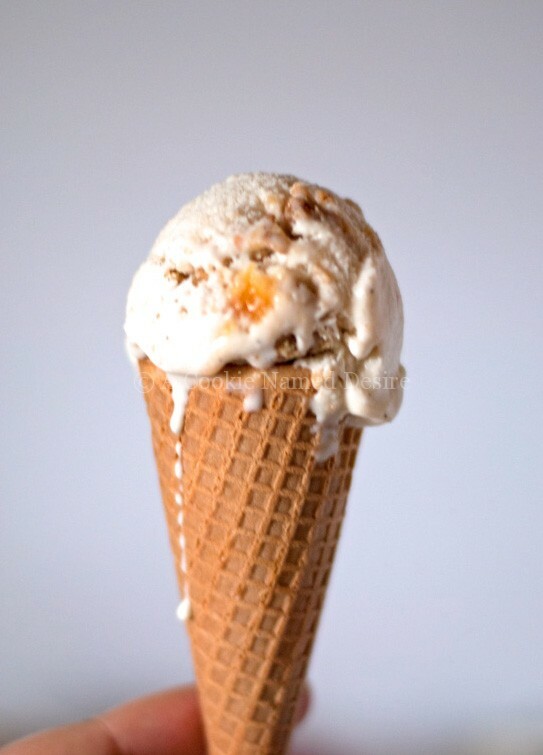 This peach crumble ice cream is the creamiest ice cream you will find with fresh peaches and a satisfying, buttery crisp topping folded in. I know, I know… I just made ice cream. But this ice cream is different. It’s life changing. Well, at least it will change the way you look at making ice cream at home. I know this because it changed my ice cream-making life. Seriously. 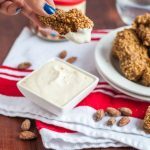 I was talking to a blogger friend of mine, Brandy from MommySplurge about homemade ice cream and how I wanted to invest in an ice cream maker. She suggested I check out Jeni’s Splendid Ice Cream At Home. She said it change her ice cream making and it was the one recipe book she would never get rid of. I was sold and bought it seconds later. Best. Decision. Ever. 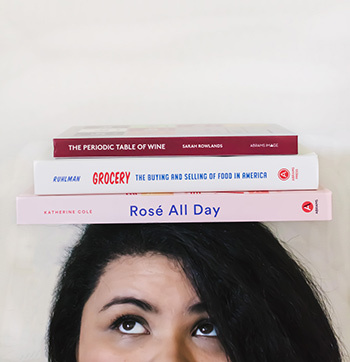 Jeni talks about the science behind ice cream and balancing out the ingredients to get the best creaminess, melting rate and temperature (ever make ice cream that tasted too warm or too cold?). This woman really knows her stuff, and she should considering that she is pretty much the queen of ice cream. 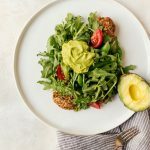 So how does this all relate to this recipe? I used her vanilla ice cream recipe (and her awesome information on ice cream making) as the basis of this completely irresistible summer treat. We’ve got sweet and slightly tart fresh peaches, buttery crumble chunks, and a velvety, creamy vanilla ice cream with a touch of cinnamon. It’s all the best things about summer amplified. And it is good. 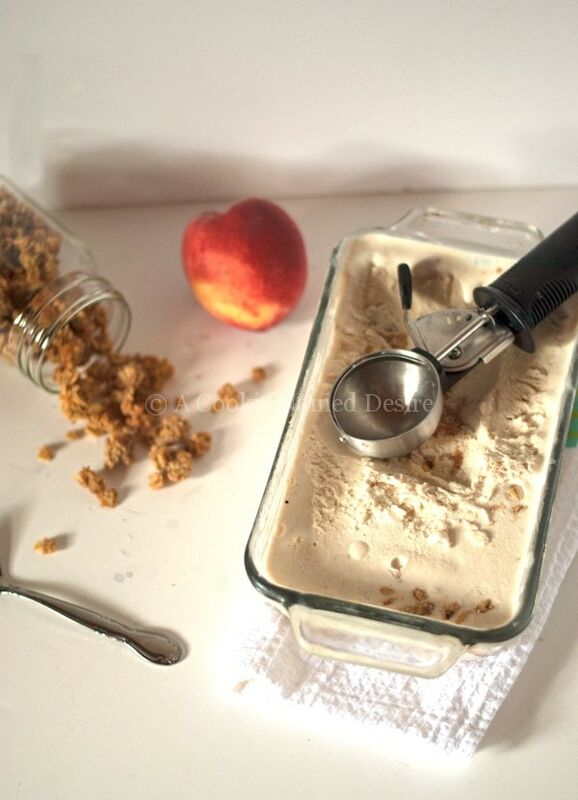 If you’ve never made ice cream before, if you’ve thought about how nice it would be to give it a try at least once, please, please, try this homemade peach crumble ice cream recipe. It is so worth it. You won’t regret it. I promise. Don’t have an ice cream maker? No problem! Learn how to make ice cream without an ice cream maker here. Combine the milk (except for 2 tablespoons), cream, sugar, corn syrup, and cinnamon stick in a pot and bring to a boil on medium-high heat for about 4 minutes and remove from heat. Take the remaining milk and the corn starch and mix well to form a slurry. Remove the cinnamon stick and add the slurry to the pot along with the vanilla extract and ground vanilla beans and put back on the heat until the mixture is thick and creamy - about 2 - 3 minutes. Cream the cream cheese and salt together and slowly add to the cream. Fill a large bowl with ice and water (heavy on the ice). Fill a large freezer bag with the hot cream mixture and place it in the bowl to chill, adding more ice as needed. Put the bowl in the refrigerator. It should take about 30 minutes for the cream to fully cool. Coat the peaches in the brown sugar. Roast the peaches in the oven at 350 degrees for about 15 minutes. Pour the chilled cream in your ice cream maker and make according to manufacturer instructions. While the ice cream is in the maker, coat the peaches in the brown sugar and roast in the oven at 350 degrees for about 10 - 15 minutes. Mix the butter, flour, cinnamon, brown sugar, and salt in a bowl. Use a pastry cutter to cut the butter in the mixture. Mix in the oats. Place on a baking sheet and break up any extra large pieces. Bake for about 30 minutes, or until a golden brown. Alternate adding chunks of peach, crumble and ice cream in layers in your ice cream container until all the peach and ice cream is used up. If there is any crumble left, place in an airtight container and freeze up to a month. Cover the ice cream and place in the back of your freezer for an additional 3 hours, or until completely set. MMMMM i am sold!!!! maybe not this week but next week i will pick up some heavy cream. now accepting flavor testing assignments for you!!!! Oh my gosh, you are going to LOVE IT! Use extra crumble chunks because they are just so tasty! 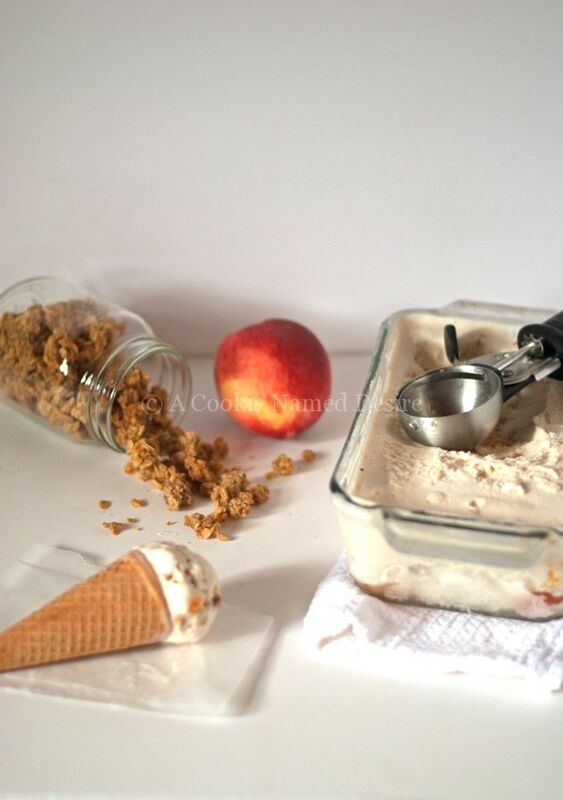 Love this peach crumble concoction; your site is beautiful and you’ve got some great talent going on! You have the best icecream recipes! Made rhubarb swirl…to die for! 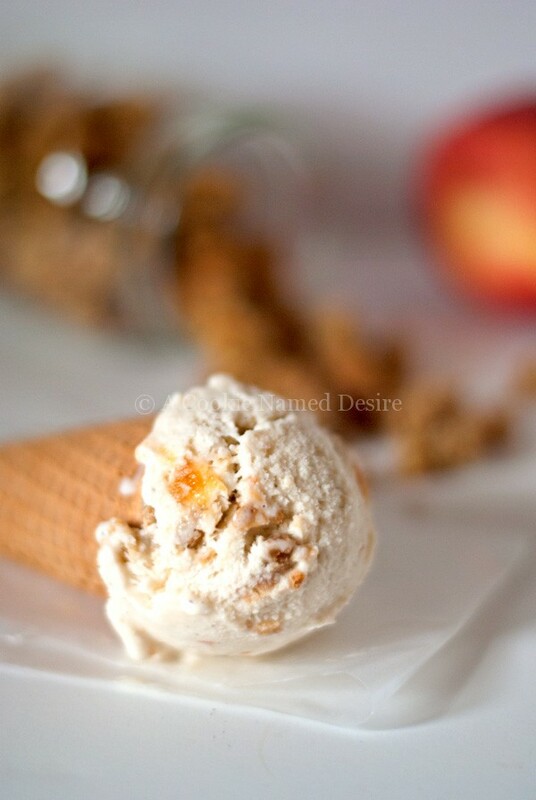 Just made peach cobbler icecream. (Didn’t see your recipe!) Was good but not great. Looked back at rhubarb recipe to make more and just noticed your roasted peach layered icecream. Gonna try that soon! Just the recipe we were looking for!